How many conversations at work have you participated in or observed that went nowhere? Chances are, you can think of more than a few. These are the conversations where everyone talks, no one listens, and the involved parties dig in their heels on their positions. There might be arguing or teeth-gnashing, and sometimes tears. Feelings are hurt, and remedies are nowhere in sight. Or, in some cases, they’re just the one-way flow of words where someone occupies the air-time describing in colorful terms how brilliant they or their ideas are. The best workplace communicators understand these unproductive workplace conversations will never go away completely. However, when they encounter these situations, they are armed with tools and approaches they can employ to improve the chances of success for everyone involved. These effective communicators understand how to gently seize control of the situation and lead with respect, empathy, and finesse. In many unproductive workplace conversations, there’s a lot of noise but little listening. In some workplaces I’ve encountered, I’m not sure anyone hears anything but the sound of their voices in their heads. Your willingness to suspend judgment and focus intently on the other individual in your conversation infuses the situation with respect, and when people perceive they are respected, they mirror the behavior. Do everything you can to let the other party know you are striving to see the situation from their perspective. Ask clarifying questions. Paraphrase their comments and ask for confirmation that you are hearing them correctly. This infusion of respect smoothes out the rough edges, assuages hurt feelings and reduces fear and insecurity for the other party. And, it raises the level of emotional intelligence present in the conversation dramatically. It’s a fact of organizational life you’ll regularly find yourself in communication situations with people who don’t give a rip about you, your opinions, or your needs. All they care about is their own needs, and you’re at best a distraction and at worst an obstacle. While most of us either shrink in the face of the futility and frustration of these situations or, we join the battle with varying degrees of emotion; neither fight nor flight are good options. Flight is effectively a retreat from something you need. And fighting is akin to pouring gasoline on a communication fire. Instead, you need to learn to gently assert control and drive the communication situation in the right direction. These singularly focused (on themselves) individuals are everywhere. Their narcissistic tendencies are always on display, and the dialog is nonexistent. It’s always a monologue. While escape is the first thought crossing your mind, sometimes you need to find a way to work with them. I love to gently seize control of the discussion with a bit of verbal judo consisting of praise and questions that allow them to talk more about their favorite subject, the person staring back at them in the mirror. Yes, those might feel a tad awkward, but, there’s a consistent formula at work in both examples. You divert the narcissistic communication train to a set of tracks that are heading to your destination by making it about them. Offer praise and ask them to teach. Yes, you’re feeding the ego a bit, but if you make this about your needs, the discussion will go nowhere near your intended destination. We all know some version of the character I describe in my free mini-course on coping with difficult characters, Resister Ray. Ray never met a topic he wanted to agree with anyone on or a change that he would support. Our natural tendency is to argue with our version of Resister Ray, but it’s like yelling at a brick wall. Sometimes we try and bypass or go over them; however, those tactics breed bad blood for you and Ray. I wonder why Ray is resistant to this? Has this type of issue burned Ray before? Does anyone show respect for Ray in his role? I wonder if Ray owned this change, how he might handle it? Those questions are intended to fire-up your sense of empathy and your drive to understand the situation from Ray’s perspective better. Once you’ve cut through this barrier, it’s up to you to apply the techniques described above and get Ray involved in teaching and telling. Empathy is in my experience the missing ingredient from most ineffective communication situations. There’s typically a great deal of noise, but no one “feels felt” and in fact, people often feel disrespected. The techniques in this article emphasize breaking the back of these negative dynamics and infusing the situation with respect and empathy. Just remember to be authentic with your empathy. People sense a lack of authenticity, so don’t try and fake it. We do a lot of work in our organizations in groups and on project teams. 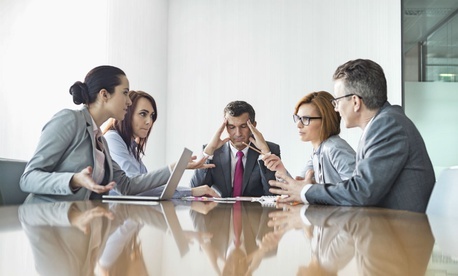 Raise your hand if you’ve been involved in one or more of these group meetings that devolved into a high-energy flow of opinions, questionable facts, political innuendo, and emotions. These are stressful, unproductive meetings that stall out on big decisions and tend to generate a lot of post-session backroom politicking. However, there are some simple but not simplistic techniques you can use to regain control before the meeting train runs off the tracks, including designing the decision-process and using a parallel facilitation technique. The decision-process question shifts the focus away from the contentious issues of the debate to a joint process development where the group can agree on something they care about—designing the approach to getting to a decision. My goal is to make sure we permit ourselves to draw upon an objective outsider. This outsider adds an element of motivation to everyone to support an effective process. These questions deftly shift the focus to facts and gaps in the collective knowledge of the group. It’s a deft means of channeling everyone into a parallel thinking process where instead of a swirl, you get the gray-matter of the group focused on one issue at a time. Importantly, this process enables you and the group to separate fact from fiction and to find the big missing holes in your collective knowledge. My favorite technique for regaining control of runaway group discussions involves incorporating my variation of Edward De Bono’s parallel thinking process. The goal is to stop the swirl of emotions, opinions, ideas, alleged facts, and political aspersions, by getting the gray-matter in the room all looking at, thinking about, and focusing on one core category at a time. Facts: what do we know/need to know? Emotions: how do you feel about this situation? Risks: what can go wrong? Ideas: how can we do it? Positive Outcomes: what can go right? Learning to seize control of the conversation with this technique gently is a game-changer for you and your group discussions. It’s also contagious and will spread surprisingly fast to other discussion situations. The bottom line for now: It’s a fact of organizational life that the only way to new, different, and successful runs through one or more challenging conversations. Your personal challenge is to rise above the noise in so many of these settings and find a way to nudge and guide them in a direction that creates clarity that begets progress. If you don’t do this, chances are no one will. Seize the moment and steer the conversations for more productive outcomes and you’ll be surprised how fast doors open in front of you.